Make a thick paste of coconut, onion, coriander leafs, cumin seeds and ginger garlic paste. and separately make a paste of tomato and tamarind. and keep all the pastes aside. In a deep frying pan add oil, curry leafs and mustard seeds, when they splutter, add the all dry masala powder and immediately add the coconut, onion paste, fry for 4 to 5 minutes. Now add the tomato and tamarind paste, mix it well, then add 2 cup of water and salt, and allow it to cook for another 4 to 5 minutes. Serve hot with plain rice and boiled egg. It will taste faboulse. Yummy .. perfect for rice of even for rotis I think. Feel like having this delicious curry with some rice and papads, tempting! New to me, thanks to the blogging world - we come to know of many such recipes which we have unheard of. Thanks for sharing a wonderful dish. very new to me !! 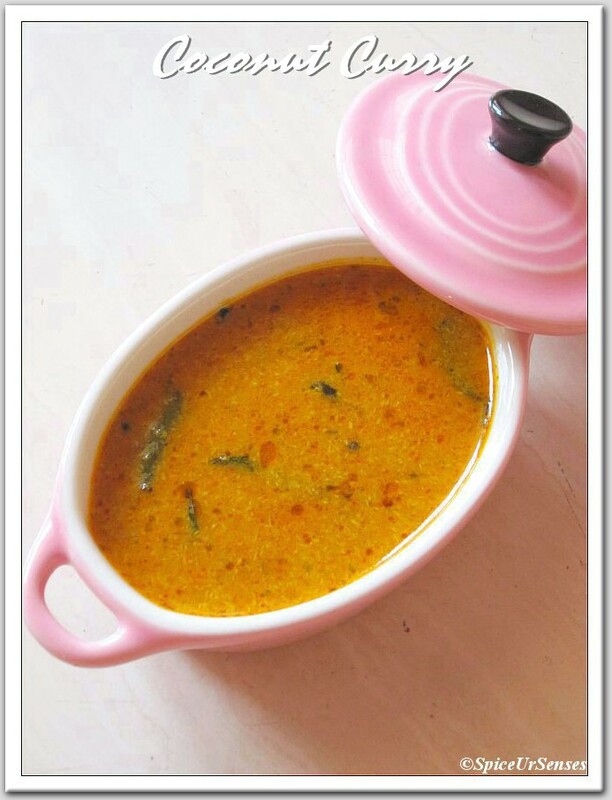 coconut curry looks so delicious and perfect with rotis !! 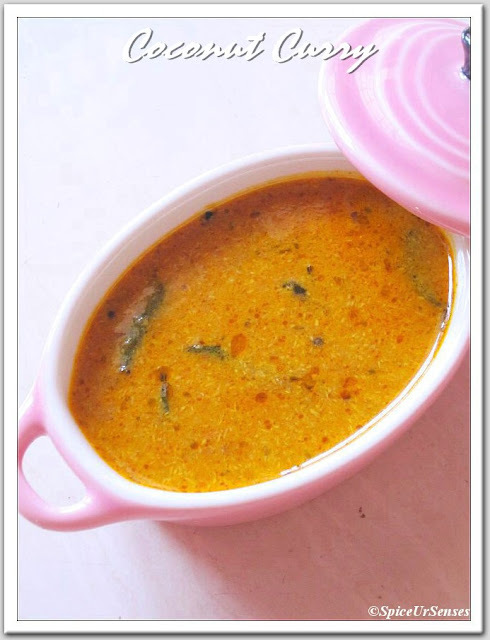 Rich, creamy n delish looking gravy! 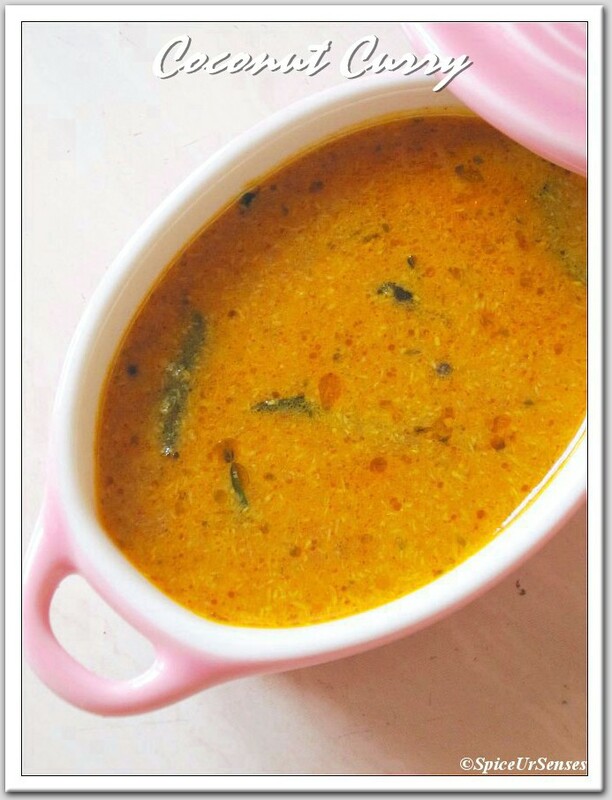 simple coconut curry..addition of veggies also makes it great..lovely recipe.. I love curry. This looks wonderful!! If you want to post a recipe tonight, just go to the Fit and Fabulous Fridays post and click on the blue frog bar and add the url of your post. Have a wonderful weekend! Oh I don't think you could ever go wrong with curry! Yum! This looks delicious. Good job. Never thought something delicious can be cooked with so little ingredients. Coconut is a staple ingredient in my kitchen -- coconut milk, cream, oil, flesh..:) Curry looks delicious.. I can imagine how good it tasted!